The topic of High Speed Rail has been much in the media recently and this Monday a group of Birmingham Friends of the Earth’s campaigners got together to have a wide-ranging discussion on this issue. We looked at the advantages, disadvantages, possible routes and alternatives to creating a network of High Speed Rail lines in the UK. In the media the impression is being given that HSR is undoubtedly the greenest option for getting people around quickly and that by building this network we will be saving huge amounts of carbon from flights. Green groups have generally given qualified support to plans, but in most of the articles I’ve seen in the press, there hasn’t been much real discussion of certain aspects of the plan that should be key. In terms of carbon emissions (reducing them is often given as a major reason for building HSR), there should be a full independent analysis of the impact of building and running this network compared to other scenarios before it is given the go-ahead. If this doesn’t show an overall cut in greenhouse gases emitted as a result of having High Speed Rail, there is no point in spending all that money and using all that carbon doing it. We must ensure that we use the most energy efficient models possible. Apparently, the Japanese bullet trains have the same energy efficiency as Pendolinos, but travel twice as quickly. Speed should not be seen as the only factor in what choices people make when they travel. This can be seen in the numbers of people who currently take coach or slower trains to London rather than the 85-minute Virgin service, which is prohibitively expensive for many. In terms of social and environmental justice, we must ensure that when public money is invested, it is beneficial for all members of society, not just the affluent few and that those who live in areas near the proposed sites of the lines will also not suffer. Just because it is a rail rather than a road-building project doesn’t mean we will apply any less rigour in assessing its environmental impact. £50 billion is an awful lot of money to spend when there are many other projects that could make a significant difference to the everyday lives of people in their travelling to and from work, study or social events. Currently the carbon costs of transport are not properly reflected in what the consumer has to pay, with large increases in rail and bus fares, but decreases in the costs of air fares and driving in real terms. This should be addressed and would possibly have just as big an impact on the choices of transport modes people make. 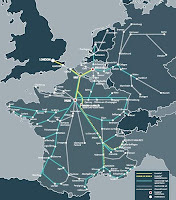 As you can see from this map, Europe has some good coverage by High Speed Rail and getting people to these destinations by rail rather than air should be the main focus. That means having a hub that connects the UK to the continent easily and conveniently (London Stratford was designed for this) and not stations at Heathrow or other airports. A station at Birmingham International would also put more pressure on greenbelt land being used for development in the M42 corridor rather than encouraging regeneration of areas in central Birmingham. In the UK the biggest carbon savings could be made from longer routes, such as up to Scotland, where air has the largest market share. However, all development of transport should be done as part of an integrated strategy, not as a stand-alone project. If we do not consider door-to-door journeys, people will still either travel by car to stations or be forced to rely on unreliable public transport (which rather defeats the object of High Speed Rail) and stations without proper cycling facilities. Overall, we should be encouraging less travel (as it all uses carbon) not more, so HSR should only be used to shift people from more polluting modes, not create new journeys. That means we also need to encourage more investment in economic development of places outside the South East, so that less commuting is necessary. Providing jobs in places such as the Black Country, Stoke and the more deprived areas of Birmingham through economic development and planning measures would ensure that existing infrastructure can be utilised more effectively and local transport networks will work more efficiently and profitably. Video conferencing should be the preferred option to travelling whenever possible as it has a much lower carbon footprint. There is an existing network that is being and can be further improved, so there must be conclusive proof of the need for new lines over and above what is already available. Also, if new conventional rather than high speed lines are built, will this not result in just as much benefit at a much lower cost. So, while High Speed Rail has been shown to work well in reducing the need for air travel on the continent, we have many reservations as to whether it is the best use of resources now. All of the above points need to be looked at very carefully before committing to such a scheme.